After what might very well be the best dinner out, ever. 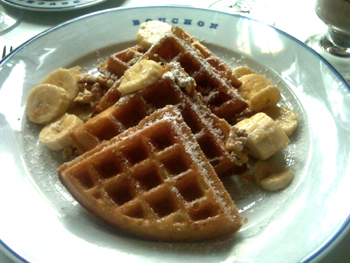 We decided to try the breakfast/brunch menu at Bouchon. Four of us were greeted again by fabulous crunchy baguette with heart stopping butter and house made jam. Oh, here we go again. A mixed basket of pastry proves they take everything seriously in Keller’s universe. 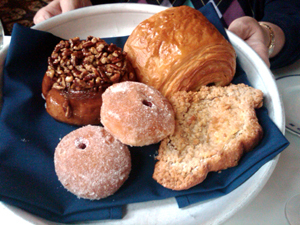 Raspberry filled beignets and sticky pecan rolls, crunchy apple croissant and croissant filled with chocolate. Ohh la la. When the baked goods are this good, what else could possibly be in store. It seems like we could be in for another wild ride. Here is the thing…at least for me. 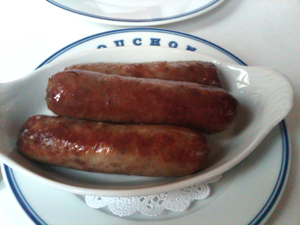 Breakfast just isn’t the medium to carry the magic that was and is Bouchon for us. 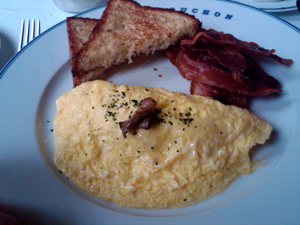 The wild mushroom and country sausage omelet was great, but it was just that, an omelet. Scrambled eggs holding some stuff together. As you can see, the bread-pudding style French Toast and the Quiche Lorraine are picturesque specimens worthy of cookbook centerfolds. 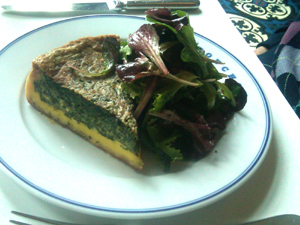 How do they separate those layers of the quiche, one only eggy and the other so spinachy, while maintaining a consistency somewhere between stirred custard and melted butter? Too much for me to figure. Tahitian vanilla bean butter and real syrup make for a much more interesting than usual waffle, particularly as these are sourdough. 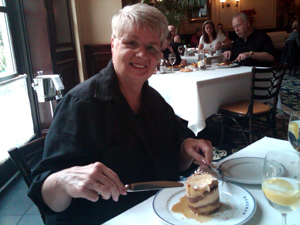 It was a great breakfast…. But it was breakfast. Dinner was magical, unexpected flavors and textures, throwing you for a loop before all coming back together like those 3-D pictures when you finally get to see the sailboat. At breakfast the bacon was excellent. But again it was bacon. 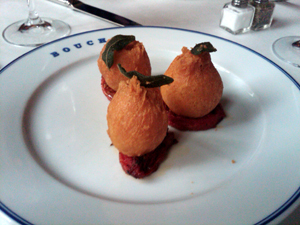 The biggest surprise of the morning came in an unusual morning special, Beignets de Brandade au Morue. 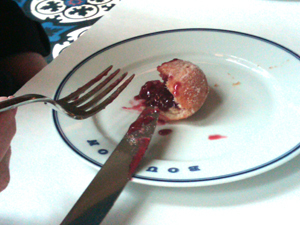 A weird but delicious salt-cod doughnut served with sage and sundried tomato. 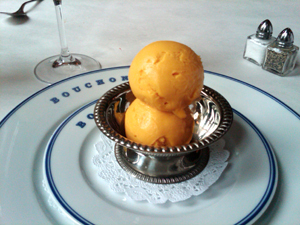 When you see something like that you just gotta know what's going on, have to taste and when you see it at Bouchon it’s like a travel suggestion from God. 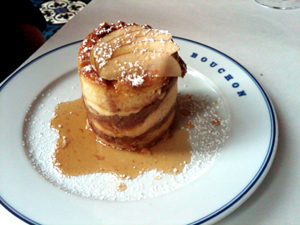 If your only opportunity to go to Bouchon is for breakfast, check it out. If you can wait until the sun starts to wane I believe you will be amply rewarded.